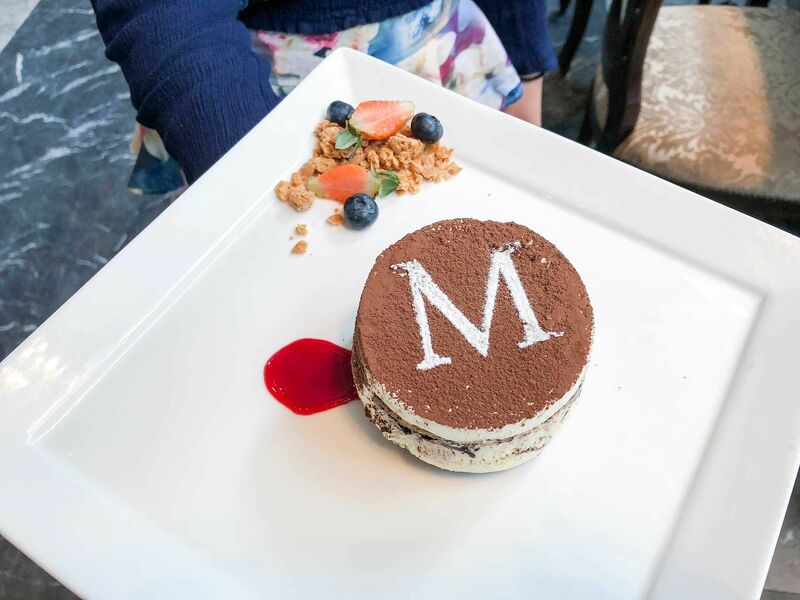 M Marini Caffè occupies a significant area at ONE KL, serving up Italian and Malaysian foods in a luxurious yet relaxing environment. If you enjoy a swanky Italian café that has more to offer than just coffee, you've come to the right place. Situated at ONE KL, the café arm of the Marini's Group that was once at KLCC, has quite the presence at the ground floor of the building, decked with a mix of plush chairs, tableware and artworks that complement the slightly ecletic vibe of the place. You can expect a quiet ambiance to go with a good cup of coffee at M Marini's. When it comes to food however, expect the use of luxe ingredients in a menu that splits itself between Malaysian and Italian offerings. Teriyaki chicken, seared tuna tataki style and a poached egg comes with a selection of greens and cherry tomatoes in a tart light vinegar dressing. The dish has a nice balance of hefty proteins and light vegetables, with the chicken and tuna having a plesant slight smoky flavour that counteracts the acidic dressing of the salad. A generous portion of proteins also makes it great for sharing. Italian salted cured fish roe becomes the star of this simple pasta dish at M Marini. The spaghetti used was slightly thicker, which translates to a denser chew and a heavier mouth feel, while the bottarga itself had a satisfying buttery taste that intensified with each forkful. Helping to add to the dish's flavour profile, herbal and chilli nuances rounds out this easy-to-like dish. The Japanese counterpart to bottarga, karashi mentaiko (spicy pollock roe) and seaweed is cooked with pasta for an asian twist on the previous dish. Pleasantly spicy with a savoury tang, the subtle taste of the mentaiko allows the natural flavours of the pasta to shine on its own, even with the inclusion of roasted seaweed. Alhough the colour might seem unusual to those unfamiliar with mentaiko, this dish is a delicious fixture on the menu. The humble nasi lemak has been reinterpreted and reimagined in so many ways that it's hard to keep count of what's good and what's not. Fortunately at the café, the ubiquitous Malaysian dish comes as one would expect, with the usual sides of peanut, egg and ikan bilis, acar, sambal sotong and one dish that receives a luxe treatment – wagyu beef rendang. Incredibly tender and succulent, the rendang is definitely the star of this dish, going great with the coconut rice and condiments but also playing nice with the accompanying sambal sotong. Be warned, this dish is quite hearty. Who doesn't love chicken rice? This common hawker staple has been proven that it doesn't need to remain in the hawker and can shine virtually anywhere. The café's version features rice that has the usual chicken flavour you know and love and roasted chicken that really nails that succulent grilled flavours you want in your chicken. The chilli sauce also hits the mark, making for another good Malaysian option. Even with a strong cream cheese flavour and a pleasant coffee taste, this dessert wasn't too sweet or heavy. Great for sharing, those looking for a dish to end the meal can order this timeless dessert to end the meal. If you're not having a meal, it could also perfectly serve as your teatime snack. You don't really need an excuse to have good tiramisu after all.